What can go wrong with a Ballasted Rubber Roof? 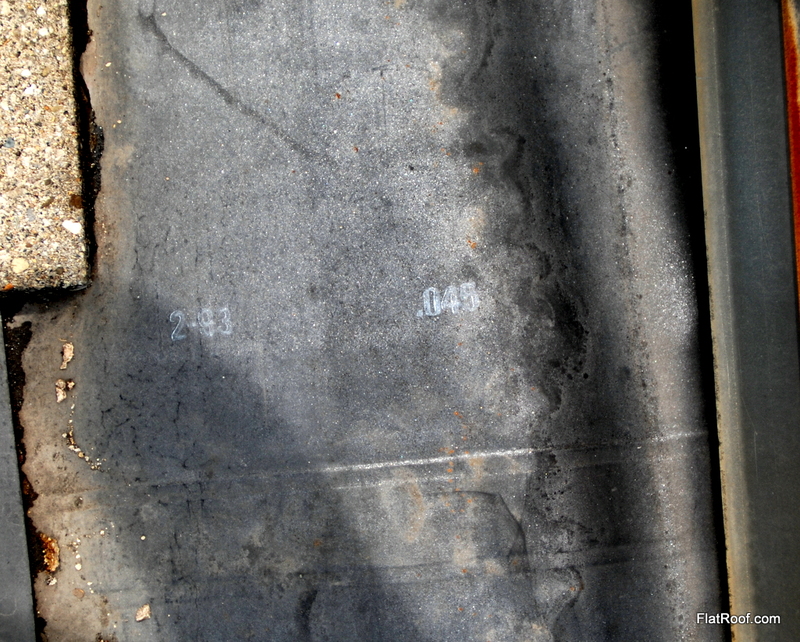 You are here: Home \ Blog \ Roof Repairs \ What can go Wrong on with a Ballasted Rubber Roof? 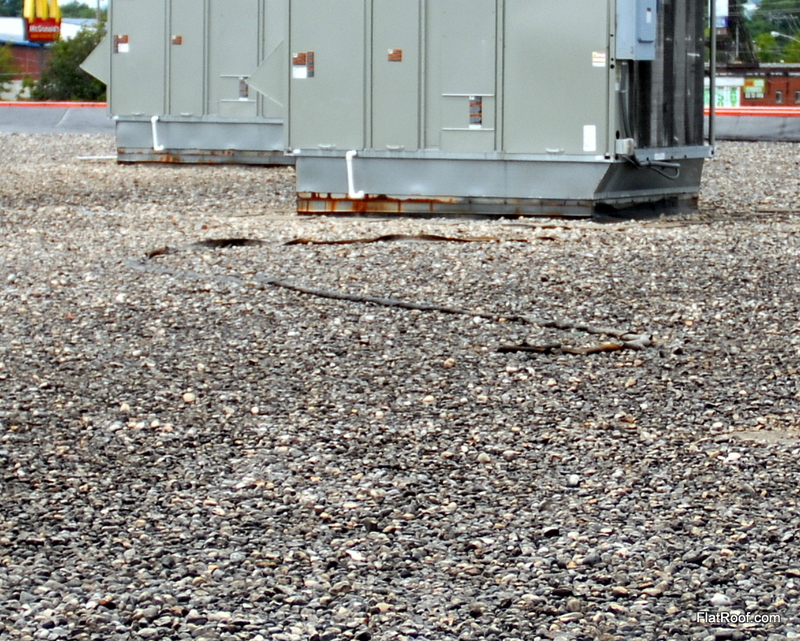 What can go Wrong on with a Ballasted Rubber Roof? This week we found everything that can go wrong with a rubber roof all in one place. 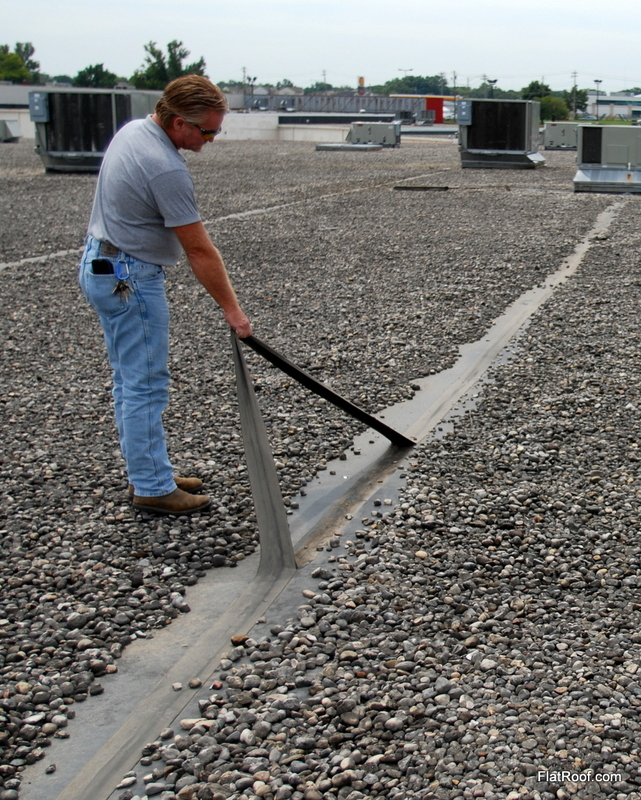 Here are a lot of the major Ballasted Rubber Roof problems, and some examples of how not to fix them. 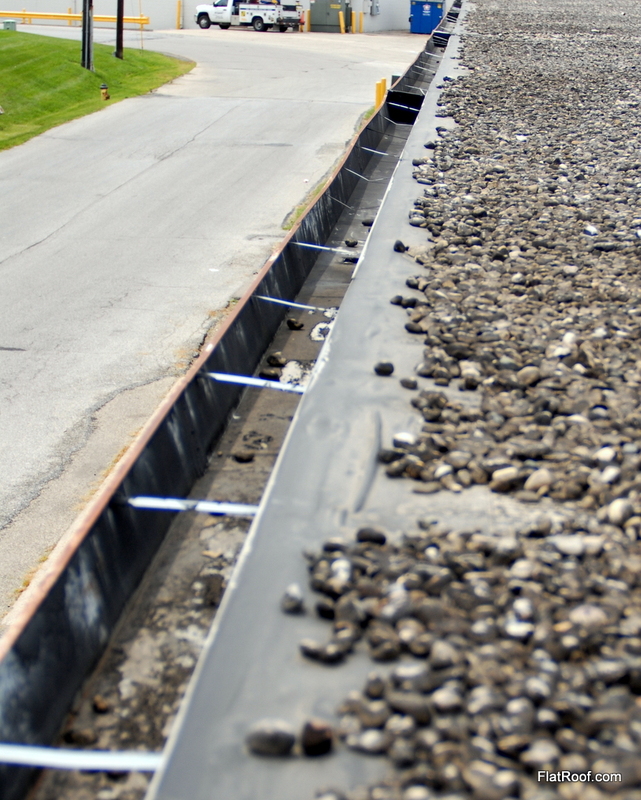 As Ballasted Rubber ages it shrinks, and will pull at the edges, curbs, and stacks. 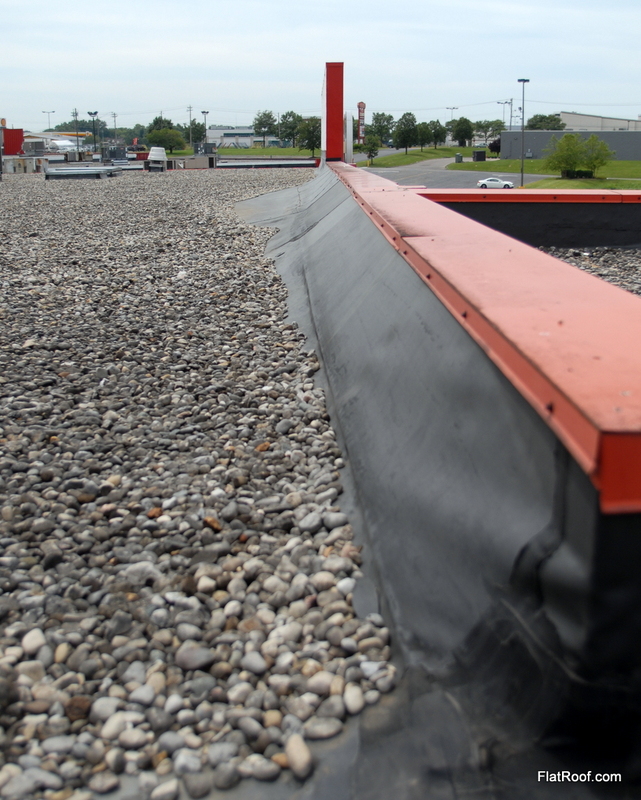 Shrinking Rubber can pull against gutters and twist them out of shape. 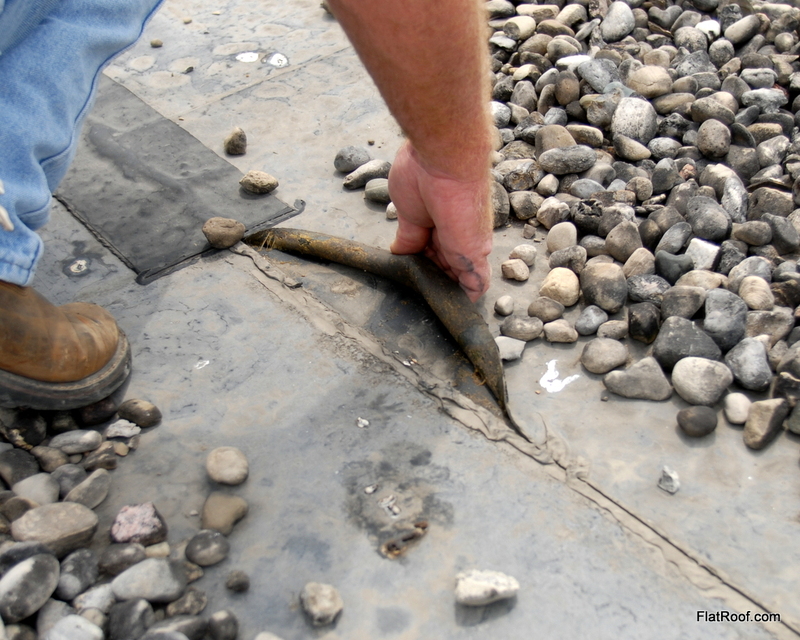 This Picture shows what can happen to a gutter that has been pulled on by a shrinking rubber roof. It’s a little difficult to see, but the outside edge of this gutter has been pulled up by the rubber. Over the years as this roof contracted, it pulled away from the edge. At some point a leak developed along this edge, and a patch was stripped in. The roof continued shrinking and that patch has now split open or torn away from the edge along most of the edge. Shrinking causes rubber to pull away from walls with drastic effects. Here the rubber material has pulled so hard that it has pulled away from the wall. As storms come through, it will continue to move the rock back away from the wall and eventually rip free of the wall completely. The seams on this roof split and someone patched it back together, but they used yellow glue which will not hold up when attaching rubber to rubber. If your roof is improperly repaired, it might not hold up. When yellow glue looses it’s hold the patches put in place by it will pull apart with little effort. When we get on a building like this we always wonder: How much money has been spent on patch work to get just a few more years out of this roof. How much of that was spent on repairs that weren’t done correctly? If you want rubber repairs done right or to avoid the slow monetary drain that can be caused by an aging rubber roof give us a call. We have the experience to guide you to the solution that is best for you. Remember, evaluations and estimates are always free.